We at Riverfront have successfully negotiated our way through the madness of the month of March 2016! Having originally planned to give the kids two weeks off in March (the second week of March break, and Easter weekend), we ended up deciding to plough right through it. We have spent most of the last three weeks with about half our numbers – various kids were away on one or both of March break weekends, and for Easter, as well. But we’re really glad that we kept going, because we still accomplished a lot. And our JUNIORS are back! Junior cast members are now joining us from 10 a.m. to noon every Saturday, getting the hang of the musical numbers in which they appear, and catching up with the scene work where they have lines. They had a good break, I think, and all seem happy and eager to be back. We have the most Juniors that have come back to us after their Christmas show for a long time! 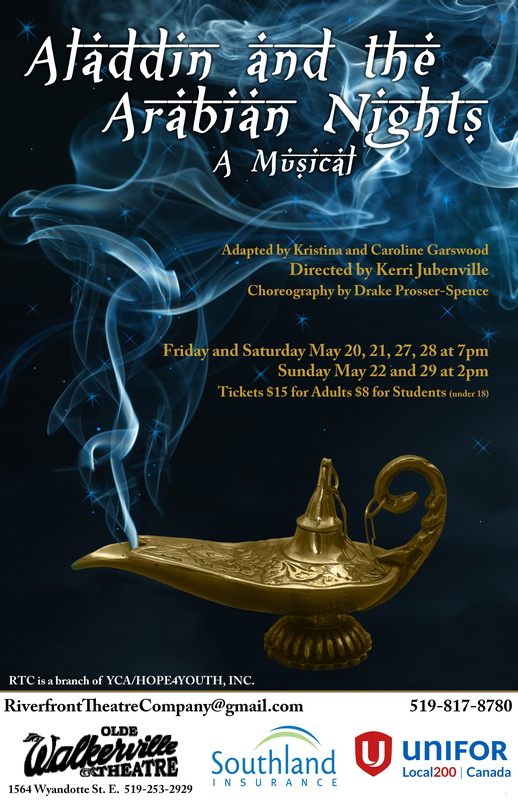 We have SIXTEEN of them, bringing our Aladdin cast to a grand total of 46 students! Our choreography is tightening up, our line delivery is sharpening, and our energy levels are high. This play is hugely popular with the cast, and generating excitement with the public any time it’s mentioned! We have a little more Pride and Prejudice excitement too, in April. We have been asked to perform selected scenes from Pride and Prejudice in a small reprisal at a private event mid-month at the Duff Baby House. We’re thrilled to have the opportunity! Our two school shows (Friday May 20th and Friday May 27th, both shows, 10 a.m.) already have bookings well underway – we’re nearly half sold for the first show already. School flyers will be going out to our students’ schools in the next week or so, and we look forward to filling The Olde Walkerville Theatre seats up once again. Our Costume Director is hard at work making things of beauty to fill our stage with light and colour. It’s all very exciting. And I know you want to be part of it! Contact us at RiverfrontTheatreCompany@gmail.com to book your class or community group for the school shows soon! Seats are $5 each. Tickets for regular performances will go on sale soon! Previous: Previous post: BOOM Shaka Laka Laka! Next: Next post: We're getting closer to Aladdin!